I wasn't going to participate in any QAL's as I just have too much going on at this time. Unfortunately my will power wasn't strong enough to resist this one. Who can resist black and white with a splash of colour anyway. Not me! 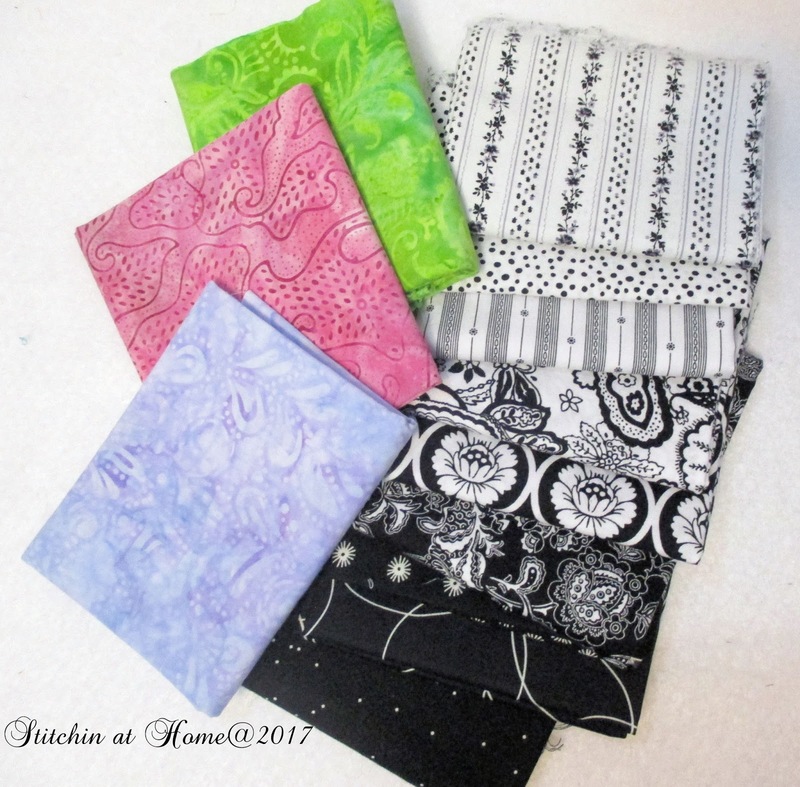 The Splash of Colour QAL is being run by Myra @ Busy Hands. I have a nice collection of black and white fat quarters that have been begging to be used in a project. Instead of just telling them to quiet down I crumbled. I pulled some of those fat quarters out, for the splash of colour I pulled some batiks out. Now the big decision... What pattern was I going to make? I opened EQ7 and started playing around, next thing I knew I had three possibilities. Now to narrow it down to one. Let's see what they were. number 2. I like the QST's and strips. A decision was finally reached! Thankfully I only drew up three. I have decided to make number 3, the compass. Have you ever felt like you can't take on any more and then you get pulled in for another project? I know I can't be the only one. The compass really jumped out at me, too! I look forward to seeing it come together for you. I think I suffer from FOMO -- fear of missing out. LOL At least this QAL is allowing me to make a pattern I've wanted to make for some time. I was going to say #1...until I saw #3. Great choice! Ooh, I'm so glad you chose number 3 - it was my fav too! It's going to look stunning and I can't wait to see your progress. Your compass will look amazing! So glad you're joining us in the QAL. Excellent choice, Cindy. It would be fantastic. It is also the most challenging but I have full faith in you!! !